It’s definitively a marker in food history when the Michelin Guide award two Singapore hawkers a star. Hill Street Tai Hwa Pork Noodle opened it doors in 1936, moved to Marina Square in 1986 before it moved again to the current location in Crawford Lane. My excuse to interfere with Singapore hawkers in a blog on food in Bangkok is of course the Michelin star awarded in 2016 and the standard it sets for street food in the region. Most of the attention has been given to the other hawker, Hong Kong Soya Sauce Chicken Rice & Noodle as it is the cheapest of the two – giving the newspapers an easy story to tell. But personally, I find Hill Street Tai Hwa Pork Noodle a much more interesting hawker than the Cantonese soya sauce chicken and BBQ pork. It’s a simple reason behind that statement, the dishes has much more complexity and layers of taste than what’s served at Hong Kong Soya Sauce Chicken Rice & Noodle. Hill street is famous for it’s pork noodle, also known as Bak Chor Mee or BCM (aka minced pork and noodles) – a true Singaporean dish. Today it’s run by the 2nd generation of the family, but from what I understand from speaking to a couple of the elderly regulars in the are, the consistency of the quality has been there all the time. Saying that, they point out that a difference from the former days is that wontons and dumplings was added at some point back in time. So what is BCM? The main ingredients are egg noodles, a vinegary based sauce, chili oil, tender pork and liver slices, minced pork, pork crackers, dumplings, wontons and fried sole fish. And of course the broth. In other words real comfort food where the magic lies in top ingredients with a mix of textures and cooking skills far beyond the ordinary. 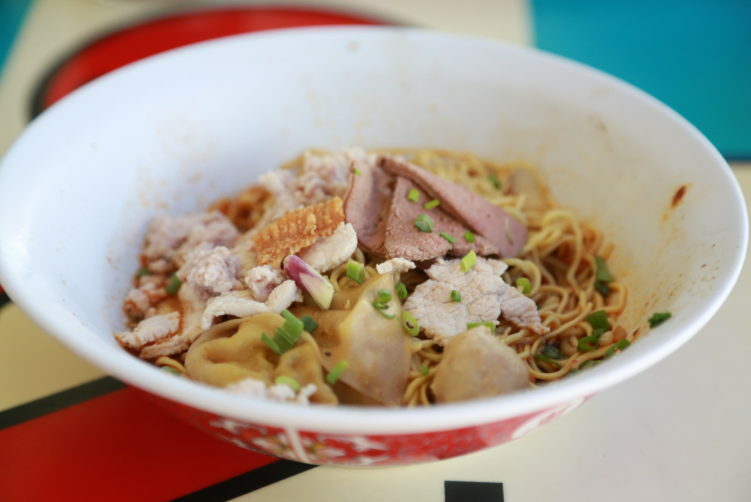 The noodles at Hill Street Tai Hwa Pork Noodle are not your ordinary mee kia and mee pok. The egg noodles are slightly thicker with a more biting result. And there is no alkaline pungency as you experience in many of the ordinary stalls. The minced pork and the meat balls are very good, as are the other ingredients thrown into the bowl, including the fried sole that gives the dish a crunchy texture together with the crackers. Also, the liver is not overcooked, another pitfall many hawkers openly stumble into. 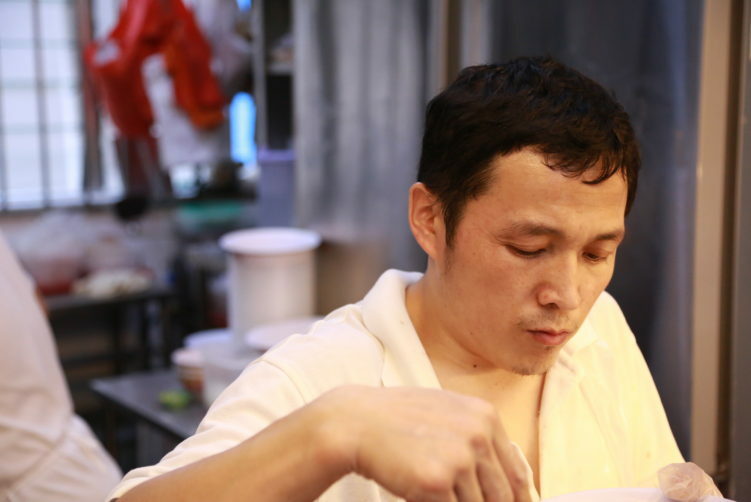 The chef and his son at Hill Street Tai Hwa Pork Noodle watch over every bite they prepares to make it perfect, also a reason why it takes time to put together a bowl. But what really separates the bowl at Hill Street from other good experiences with BCM is the vinegar based sauce that balances the “fattiness” of the minced pork in a very good way. Another good thing is that the broth, with an intense meaty flavor, comes on the side. I don’t know the Singapore hawker scene in detail, but have tasted enough vendors to say that Hill Street is definitively up there when it comes to Teochew style Bak Chor Mee (minced pork noodles). The price is topping the normal, with $6 for a regular bowl, but the quality is high and quantity is slightly bigger than other places I tested. 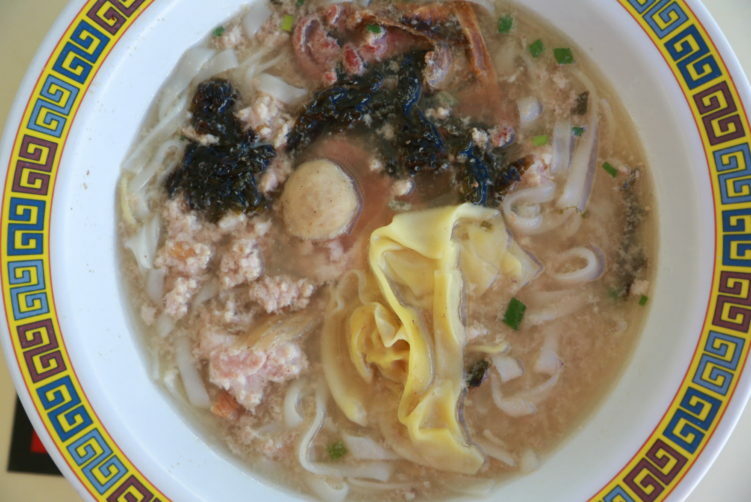 I also tested the kway teow soup – noodles with minced pork and some fish balls and other ingredients in a delicious broth. Another dish with personality, separating themselves from the crowd. I visited Hill Street Tai Hwa Pork Noodle three times in three days to check consistency, and every time it was the same good quality. It’s self service so you need to cue. They will ask you to step out of the cue to order, then you step back in the cue and move until you reach the desk and you get your food. I went there around 4-5 pm and all my visits implied 20 minutes of cuing. Well worth it, but certainly a moment to consider if you go there prime time lunch or dinner. They are suppose to close 9 pm, but from what I understood from speaking with locals, they often close around 7:30 or 8 pm as they run out of food. Not a word of English is spoken, but somebody in the cue will help you out if you get into language trouble. Don’t forget to order the plum and lime juice at the drinking counter next to it. It really goes well with the food served at Hill Street. Will I go back? 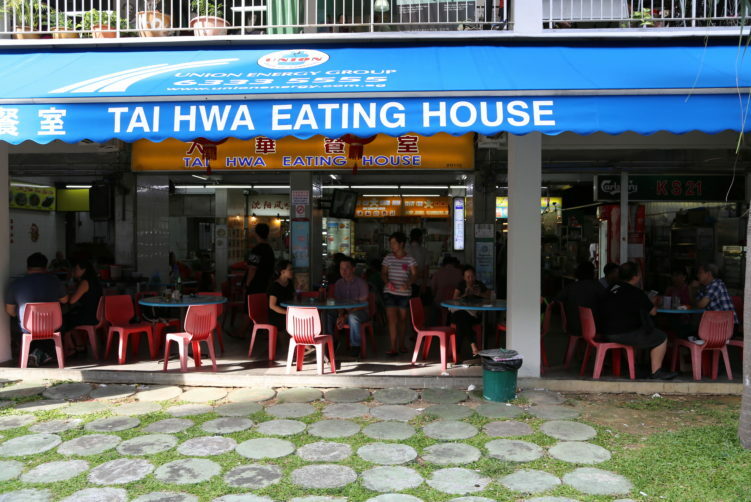 Definitively, most likely my first stop on my next visit to Singapore. There’s a toilette on site, but probably not with the style you consider appropriate for a full reading of the last edition of Micky Mouse or any other magazine. The Michelin Guide rate their experience according to five publicly acknowledged assessment criteria: quality of the products; mastery of flavour and cooking techniques; the personality of the chef in his cuisine; value for money; consistency between visits. The restaurant inspectors do not look at interior decor, table setting, or service quality in awarding stars as this is indicated by the number of “covers” it receives – represented by the fork and spoon symbol. In other words, they can hand out their stars to street food vendors and hawkers. And personally I’m a big fan of that decision, even if some of the vendors don’t live up to the Quite Comfortable level. Hill Street Tai Hwa Pork Noodle is worthy a star, using the five assessment criteria. There’s plenty of Michelin Star restaurants in France and Belgium that doesn’t serve you food this good – we all know that the French have been generous when handling out the stars in their own backyards. I’m absolutely in no doubt that Hill Street Tai Hwa Pork Noodle will continue to serve their quality food day inn and day out – they have been doing that for decades already. In other words, The Michelin Guide has just handled out a star for life as there will be no change in quality here. These guys can repeat the dish with their eyes closed. I do look forward to the Michelin star for Bangkok as it’s plenty of vendors to turn to for an excellent plate or bowl in the city of angels. I will get back to this in a later article, but that said. I do understand why they started with Singapore as it’s food scene is much more transparent than Bangkok. That said, the future looks bright for Bangkok in a Michelin Guide setting, unless the government continue their unnecessary crack down on serious and hard working street food vendors – there are other ways to make the streets accessible. click here Price: Depending on the portions, ranging from $5, $6 (regular), $8 and $10. order now Open: Daily. Closed 1st and 3rd Monday of the month. Be aware that they normally close earlier than the opening hours as they sell out. It normally close 9 pm. but it would be wise to be there before 7:30 to be sure. How to get there: Take the metro to Lavender station. It’s a 5 minutes walk from there. Hill Street Tai Hwa Pork Noodle is worthy a star, using the five assessment criteria. Definitively up there when it comes to Teochew style Bak Chor Mee (minced pork noodles). 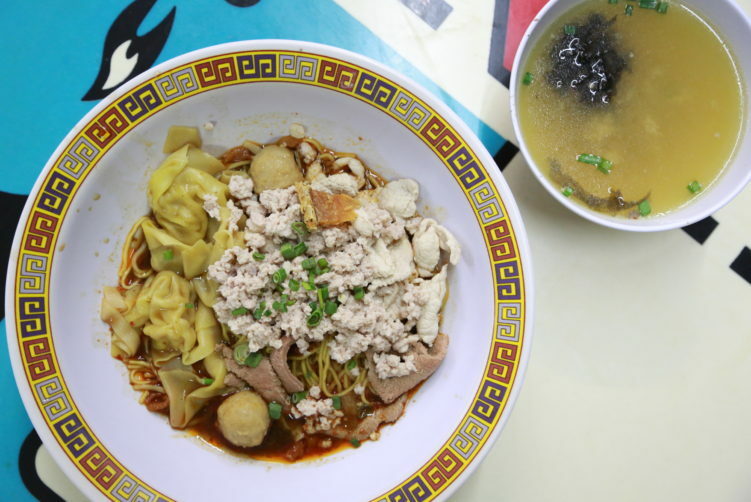 Don't forget to also try the kway teow soup - noodles with minced pork and some fish balls and other ingredients in a delicious broth: See full review at StreetsideBangkok.